It’s no secret that shipping requires a lot of space. Whether you are running a new online sales business or have a giant warehouse full of stock, your business requires real estate. The only issue is that in a changing marketplace, real estate investments are not always ideal. Modular shipping offices are a growing trend in the industry because the can easily be expanded or reduced as business needs change. The modular style also allows them to be placed almost anywhere, eliminating the need for expensive real estate. Modular shipping office services available online can be as small or as big as you like. Because there are many different types of businesses within the industry, modular shipping offices can be built to fit your companies needs perfectly. Whether you need a large, open space for sorting or narrow hallways for multiple offices, your modular building can include them. Modular shipping office suppliers know that your business needs require flexibility. While the shipping office price is generally very low when compared to traditional buildings, you are able to pass the savings on further by taking up previously unused real estate. The modular design also allows for you to build upwards, taking advantage of vertical space as needed. This helps you get the most out of the real estate that you already have, rather than forcing you to invest in more land. Cheap shipping office prices online also don’t reflect how easy it is to modify the building to your needs. For example, if you need to expand, an additional modular office can be added on. If you want to remove and sell that modular office later, it can easily be removed from your property. This offers you more flexibility than a traditional building and helps you recoup your money if you need to downsize your operations. In addition to building your modular shipping office as big or small as you like, you can also customize it as much as you like. On the interior, elaborate HVAC systems can be included to help keep you and your employees comfortable. On the exterior, a number of doors and windows can be added to give your building a unique look. A variety of finishes also help you match the exterior to existing buildings for an all-around professional look. 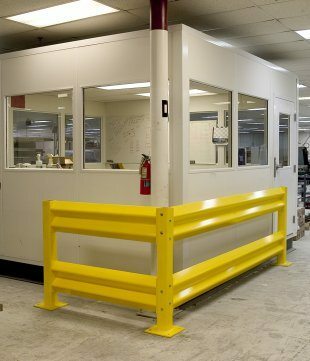 Companies like Panel Built also help make your shipping office unique by ensuring that it can endure the tests of time. High quality buildings are able to withstand many harsh weather conditions and excessive rain. The materials used in construction can also be treated to withstand rust or other corrosive elements that would normally hurt the value of the portable shipping office. One of the most appealing parts of getting a shipping office online is the lower price points. Part of the reason modular shipping offices are becoming an industry trend is that they are more affordable than traditional buildings. The shipping office price also reflects your exact specifications, so businesses do not need to pay for features or rooms that they do not want. Companies like Panel Built also help cut costs and make owning a shipping office more affordable by moving the bulk of their sales online. The shipping office for sale can be seen on the company’s website and ordered when speaking with a customer service representative. Many companies that sell modular office are not this affordable because they have showrooms or other selling expenses. The best available modular shipping offices for sale can be found at Panel Built and the ordering process is very easy. Once you place your order, Panel Built experts start construction at their location. The building is prefabricated and then moved to your location once completed. It’s that easy! Being able to assemble the modular office building at their location gives you several advantages. Experienced technicians are able to construct and inspect the building, paying close attention to detail. They move in an assembly line fashion, getting only the best people to do each job. This helps you get a better quality building and allows for faster manufacturing. Most buildings are constructed in only a few weeks. Panel Built prides itself on accuracy and speed. In some cases, the technicians at Panel Built will be able to complete your building in a matter of days. Small shipping offices may be completed in under a week. This helps you get back to business as soon as possible. There are many companies that sell modular office buildings online. This growing trend is a great way to expand your shipping business. Many modular shipping office services available online will be able to help you get the space you need to effectively run your business. With a variety of great benefits, your modular shipping office could be exactly what you need to increase productivity. Get a practical solution for your shipping office by contacting Panel Built today. These modular shipping office suppliers will be happy to answer any questions that you may have and help you learn more about this growing trend. If you are wondering where to buy shipping offices, look no further than Panel Built.